All you need is a Samsung phone and a slightly goofy-looking virtual reality headset. If you can bear to look like you’re living in the Matrix, CNN is going to be offering a virtual reality livestream of its upcoming debate on October 13 in Las Vegas. “You can, through this helmet, get an absolutely first-row-seat experience of being at this debate,” said Jason Farkas, the executive producer at CNN Money who is spearheading the project. To access the stream, you’ll need a Samsung Gear and smartphone. 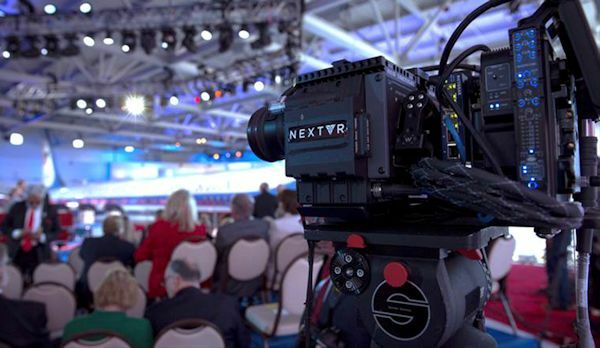 It will be available through NextVR, the company that is powering the technology. CNN has already shown that it is keen to use its debates to push into newer technology. Realizing that the second Republican debate was bound to attract a major audience, the cable network streamed the event online and through its app. The debate still pulled in a record audience for CNN, as well as 4.5 million streams. Farkas said that CNN realized that there’s not a huge audience for virtual reality right now, but that the company wanted to be ahead of the curve. “Most people haven’t even tried virtual reality, and we’re really pushing the envelope here,” Farkas said. Virtual reality is gaining an experimental foothold on the evening news. Earlier this week, ABC News, working with JAUNT, debuted its VR reporting through a piece that took viewers to the streets of Damascus, Syria. Other smaller efforts have included MTV’s VR stream of the red carpet of its recent Video Music Awards, and a soccer match between Manchester United and FC Barcelona recently got the live VR treatment. The National Hockey League has also been testing live VR. CNN tested the VR experience at its recent Republican debate and has a released a clip for people who want to try it now. Anyone with a Samsung Gear can check out a clip from the debate. While not too many people are going to want to wear the headset for the duration of the debate, it is a completely unique experience. You very much do get the sense of being there, with an ability to look at the audience, the moderators and even the other candidates as they react. But the shortcomings of being there also shine through. You don’t get the production of zooming in on each candidate as he or she speaks, which is actually something I began to miss after just a couple minutes. The resolution also isn’t quite there yet, meaning anything not near you tends to be a little fuzzy. For instance, the candidates’ faces are pretty indistinguishable. This is still just a smartphone screen after all. But there are definitely other perks. In the audience was the governator himself, Arnold Schwarzenegger, who you can also watch throughout the clips. It’s kind of surreal. That’s just fine with CNN. Ed O’Keefe, head of CNN politics, said that the company has a legacy of being at the intersection of journalism and technology. Pushing into VR, he said, is just the most recent example. “Virtual reality isn’t the next big niche. It’s the next big mainstream thing, and we want to be there,” he said.